Work is pretty dull. Google wants people to use its products to get stuff done, and the company's previous name for its efforts in this area - Google Enterprise - fully communicated just how stuffy and non-exciting the experience would be. Now the search giant is changing the name of its business-related offerings to something that, while equally mundane in its approach, doesn't have to show up for work in oxford shoes and a tie. 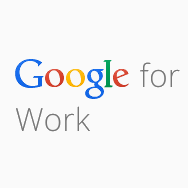 'Google for Work' is a name that more accurately represents the type of people, businesses, and organizations that are turning to the company's cloud solutions to get the job done. Microsoft has held a firm grip on the business market for a long time now, but Google is making inroads. Millions of companies and organizations have turned to its products to complete tasks more affordably. They're using Search, they're using Maps, they're using Drive - and they're using them on traditional computers, Chromebooks, and Android devices alike. And many of them aren't the huge corporations that can afford massive PC deployments, their own IT departments, costly office suites, and the financial burden that goes with it all. They're not enterprise clients. They're just people who want to use Google for Work. So to me, yes, the new name makes sense, even if it is no less boring than it was before. Droid Landing Twitter Account Awakens, Teases "Reactivation Fast Approaching"